I used to dread going grocery shopping. I wanted to get in and out of the store as fast as possible. Things have shifted significantly over the last few months. In the summer, I decided to take a look at my spending and see if there was any places I could save money. I started with my grocery bill. It used to be that I was coming home with only four or five bags and spent well over $100. I was NOT paying any attention and never looked at sales. Enough was enough and I finally decided to start. I began collecting coupons and reading Canadian couponing blogs to try and learn as much as I could. They kept talking about something called “price matching” and how it was a key way they had slashed their grocery bill. 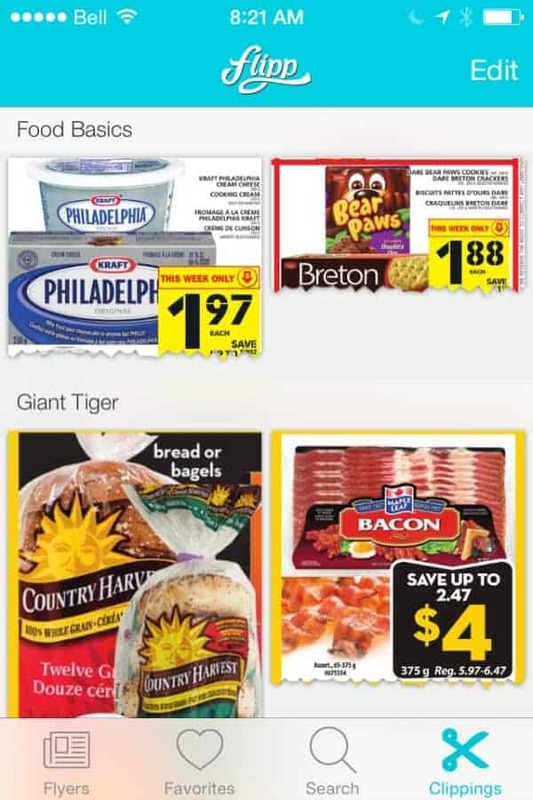 I read about Flipp, an app for your smartphone that lets you browse flyers from stores across Canada. I felt like a light switch went on in my head. I downloaded Flipp right away to my iPhone and have been using it every week since! I wrote about Flipp more in depth a few weeks ago so please check out my post about Flipp to learn more how this app can save you money. I can’t say enough good things about Flipp. I use Flipp to find the best deals at stores across Canada and then visit my local store to price match and get these great deals. If there is only one money saving app you download, make sure it’s Flipp. It’s the best one out there in my opinion! 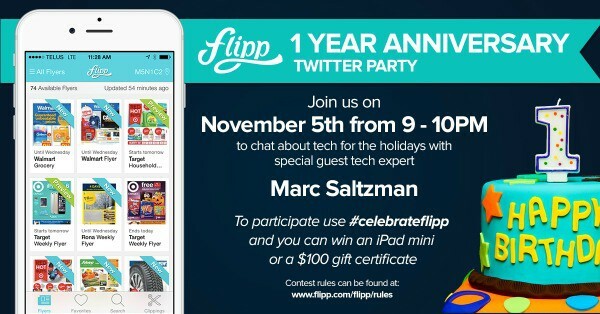 Flipp is turning 1 year old and is celebrating this special occasion with a fun Twitter Party. And yes, you are invited! We’ll be chatting about tech for the holidays and you can win an iPad Mini or $100 gift card. Marc Saltzman will be there as the special guest tech expert. I can’t wait to hear what he recommends! Eligibility: Open to USA (excludes Florida) and Canada (excludes Quebec). See full rules here. love twitter parties and this one is no exception 🙂 looks like it going to be fun!! 🙂 thanks for sharing with all of us..
Love this app. I’m going to have to remember this party!! Happy Anniversary! I love using Flipp! Lol, just finished clipping for shopping tomorrow! LOVE flipp app!! I love this, will def be celebrating with you! Excited about my new [email protected]! Ready to start saving lots of money! Thank you! I’ve heard a lot about this app. It sounds great!